We converted a document from the Text Encoding Initiative’s (TEI) Extensible Markup Language (XML) scheme to HTML with XQuery, an XML query language, and BaseX, an XML database engine and XQuery processor. This guide covers the basics of how to convert a document from TEI XML to HTML while retaining element attributes with XQuery and BaseX. I’ve created a GitHub repository of sample TEI XML files to convert from TEI XML to HTML. This guide references a GitHub gist of XQuery code and HTML output to illustrate each step of the TEI XML to HTML conversion process. Converting TEI XML to HTML while retaining element attributes with XQuery requires a number of XQuery functions, which I would normally place in an XQuery module file. This is a modular approach taken from a Wikibooks.org article with modifications I made to retain element attributes. We begin by declaring a namespace with the XQuery code declare namespace tei = "http://www.tei-c.org/ns/1.0"; in order to apply the TEI scheme to our XML. Our first XQuery function, local:dispatch(), recurses through TEI XML input to return HTML output through the use of typeswitch and case statements. Each case statment returns a specific XQuery function corresponding to a TEI XML node in the input. Both TEI XML <p> and <s> elements in our document, sample-tei-xml-document-latin.xml, have the attribute n=X to denote paragraph and sentence numbers respectively. Our XQuery functions local:p() and local:s() preserve these attributes in the TEI XML to HTML conversion by using HTML5 data attributes, and id attributes could potentially suffice for for HTML4 or XHTML. Since the <p> element functions similarly in both TEI XML and HTML we do not convert it. Conversely, the <s> element functions differently in TEI XML and HTML, and we convert it to an HTML <span> element. TEI XML uses the <hi> element with a rend attribute to distinguish text as bold or italic, for no specific semantic reason, but HTML5 does so with the elements <b> and <i> respectively. Our XQuery function local:hi() converts each TEI XML <hi> element by evaluating its rend attribute and outputting an HTML <b> element if rend="bold", an HTML <i> element if rend="italic", or an HTML <span> element if the rend attribute is neither. Similarly, our XQuery function local:quote() converts quotations from external sources encoded with the TEI XML <quote> element and evaluates the attribute rend="blockquote" to output either the HTML element <blockquote> or <q>. 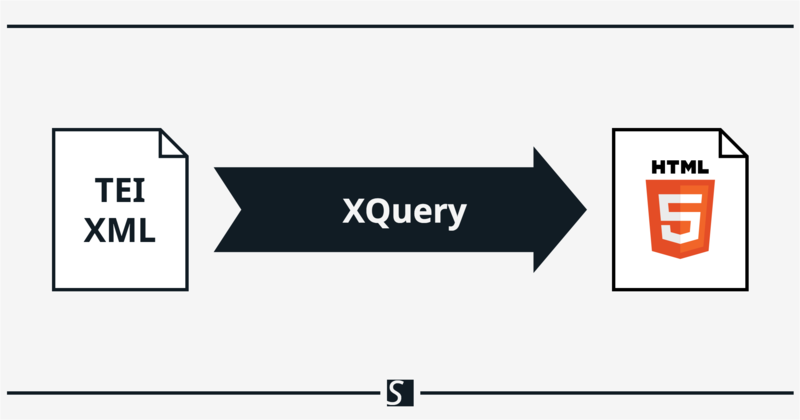 Furthermore, the XQuery function local:q() converts the TEI XML element <q> to an HTML <span> element with the attribute class="quotes" and adds single quotes to the node’s text. Adding quotes could also be achived using CSS to style the class .quote, but that is beyond the scope of this guide. In the case of a TEI XML <body> element, our function local:body() outputs an HTML <div> element with the attributes lang="la", since we know our TEI XML document is written in Latin, and id="tei-document". This use of the HTML <div> element allows us to output the content of our TEI XML document within an HTML document that already contains a <body> element, and the id attribute allows us to reference the HTML <div> element as needed. Since there should be only one TEI XML <body> element per TEI XML document, our XQuery function local:body() is our final case statement in our XQuery function local:dispatch() for the sake of efficiency. For this same reason, the most frequent TEI XML element, <s>, is our first case statement. Thank you for reading, and have fun coding.